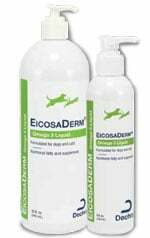 You are buying the Dechra EicosaDerm Omega 3 Liquid Fatty Acid For Cats And Dogs 8oz, model #ECW. At ADW Diabetes, we offer a wide selection of Dechra products for cats and dogs. At ADW Diabetes, we can save you money on all of your pet grooming and health care products. The Dechra EicosaDerm Omega 3 Liquid Fatty Acid For Cats And Dogs 8oz is a nutritional diet supplement and adjunctive therapy to promote healthy skin and reduce the effects of dry, pruritic skin. The fish oil source is from small, cold water ocean fish (sardine and anchovy). The oil has been fully refiend, deoderized, purified and molecularly distilled. It is tested and certified to be free from pesticides and below testing levels for PCB's and heavy metals, such as led, arsenic, cadmium and mercury (less than 0.1 parts per million). Vitamin E (as dl-alpha tocopheryl acetate) has been added to the fish oil as an antioxidant. Proper storage at room temperature and away from light will ensure quality through the experation date indicated on the product.